Since time immemorial, numerous recluses have chosen to live on Zhongnan Mountain which is considered a sacred place to achieve immortality. Throughout its history, Taoism has upheld and practiced two core concepts: ascetic seclusion and an equal emphasis on farming and cultivation. People first began engaging in Taoist seclusion 2,000 years ago and the practice continued to develop in an ancient and unique way. 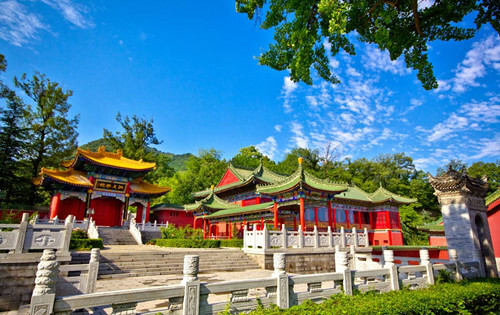 Closely associated with Taoism since ancient times, Zhongnan Mountain has long been home to large quantities of Taoist hermit priests who come to live a life of simplicity and practice the Taoist doctrine of self-cultivation. The former embodies the cosmology of Taoism. A sacred place means a microcosm relatively separated from the larger world beyond it. It is an ideal place to live with a mild climate and tranquil environment. These places are considered the homes of the Earth Immortals, so the Taoist priests congregate there to practice austerity with the hope of one day achieving immortality. Alchemical skills are the core of the Taoist life theory and cultivation system. Over time, it has transformed from external alchemy that uses metals and stones as drug ingredients to a form of internal alchemy that uses the qi—or “vital force”—as its principal means of cultivation. The Zhong Lü Golden Elixir School, which emerged during the Tang Dynasty (618-907), formed the theoretical basis of internal alchemy. It was further refined during the period of the Five Dynasties (907-960). Then the Whole Truth School emerged in the Jin and Yuan Dynasties (1115-1368) while the southern branch of the Golden Elixir School inherited and developed the doctrines of the Zhong Lü School, placing the belief in internal alchemy at its core. Practicing both kinds of alchemy requires a pristine environment, so sacred places are necessary. Zhongnan Mountain, though not included among Taoism’s most sacred places, has often been considered parallel to Kunlun Mountain. Ge Hong (284-364), a scholar interested in Taoist practice and the pursuit of immortality in the Eastern Jin Dynasty, once included Zhongnan Mountain in the list of famous mountains that suit the requirements of alchemy practices in his works Inner Chapters of Baopuzi: Golden Elixir. Early records spoke of hermits inhabiting Zhongnan Mountain. Lou Guan Xian Shi Zhuan tells an anecdote about Yin Xi, who built a thatched cottage on Zhongnan Mountain to watch the stars but eventually encountered Laozi, the founder of Taoism, and received his teachings there. The place where Laozi gave lectures has been preserved to this day. Yin is often considered the first Taoist priest on Zhongnan Mountain, and the Lou Guan School, which considers Yin its patron, became one of the first reclusive Taoist cultivation groups. In the North Zhou and early Sui dynasties (557-618), the Lou Guan School grew into the most influential Taoist school. The Emperor Wu of the Northern Zhou Dynasty ordered the abolition of both Buddhism and all Taoist practices except for the Lou Guan School. He even built Taoist temples for them around the observatory that Yin built, leaving behind remnants that can be seen today. Internal alchemy experienced a golden age around the end of the Tang Dynasty and during the Five Dynasties. At the time, the Zhong Lü Golden Elixir School coexisted and was closely related to the Lou Guan School. The five ancestral masters that both schools revered all had lived a hermit’s life on Zhongnan Mountain. The same was true of the Whole Truth School that would later emerge in the Jin to Yuan dynasties. The Whole Truth School continued the reclusive tradition of the Zhong Lü Golden Elixir School. After the death of its founder Wang Chongyang, four of his seven students buried his body on Zhongnan Mountain and sought to refine their practices there. From the Yuan Dynasty (1206-1368) to the Qing Dynasty (1616-1911), the Chongyang Taoist Palace served as one of the three most important ancient temples of the Whole Truth School, and it attracted numerous adherents. There are large numbers of valley mouths distributed throughout the northern region of Qinling Mountain to the west of Tongguan County and to the City of Baoji in Shaanxi Province. Some are crucial paths to the depths of Qinling Mountain, some are the base regions in which many Taoist palaces and temples were built, and others are dwelling by villagers. Today, most of the Taoist priests live deep down in the valleys or in the even more remote interior areas. For instance, Taihang Mountain had been a holy place of Taoism since the Sui and Tang dynasties, and religious activities were frequently held there in the Ming and Qing dynasties. But today, Taihang Mountain is a far cry from its prosperous past, and few Taoist priests remain to look after the temples. To make matters worse, the exploitation of the mountain as a tourism spot has diminished its value as a place for seclusion, prompting many of the hermits to move further into valleys. Da Yu, meaning “Large Valley,” is another sacred place where Taoist practitioners have traditionally gathered, and roads inside it can lead straight to the Seclusion Shack Districts of Jiawu Stage and Nanwu Stage. It used to also be a holy site of Buddhism. The ruins of the Tongxian Temple built in the Tang Dynasty still remain on the slopes outside Da Yu. Inside it still stand some small temples showing that many Taoists persist in their practices here in seclusion for life. The nearby Jiawu Stage was a favorite spot for practitioners of both Buddhism and Taoism, and has already been transformed into tourist scenic zones. Xu Yun, a Chan Buddist master during China’s republican era, founded the Shizi Thatched Cottage to seclude himself and practice his ideas in. Mount Taibai, the highest peak of Qinling Mountain, was a wellspring of reclusive Taoism on Zhongnan Mountain as well. At its foothills was located the Taibai Temple for making offerings to the Immortal Taibai. Ge Hong put it on the list of divine mountains suitable for mixing and measuring drugs. The king of Herbal Drugs, Sun Simiao, also a Taoist priest, used to live here and collect herbs. The Taoist tradition of seclusion in mountainous woods still remains strong in this region even in modern times. In contrast to low-lying mountains and rivers with fine weather in the eastern region of Zhongnan Mountain, it is a much harder ascetic journey to find seclusion and keep practices on Mount Taibai, which is more than 3,000 meters above sea level. It is hard to tell exactly how many priests are living in seclusion on Zhongnan Mountain. Scholars estimate that there are currently more than 2,000 practitioners of both Buddhism and Taoism, and among these, several hundred are Taoists. This statistic is in accordance with the author’s own observations. Whatever the motivation, living in the mountains means choosing a more difficult path. Seeking a secluded life and cultivating one’s capabilities is by no means a picturesque pastoral life of poetic liberty. It means loneliness, poverty, and inexpressible bitterness as well as troublesome problems you can never get rid of. The reclusive Taoist priests the author met in the research adopt the simplest and most primitive way of living. They reside alone in crude shacks or caves, grow a few vegetables around where they live, have two meals a day and sit in tranquility or carry out other rituals. Elder Taoist priests are better conditioned to bear the rough life, while those who are much younger can hardly persist for a few months or more. Only a minority of them can live in the mountains for years. Many view secluding themselves in mountains as a form of cultivation. So members of the reclusive cultivation group are dynamically renewing and cycling through. For those who do adore dwelling in mountains, seclusion is indeed a rare experience in life. However, for those who lack the choice to decide where to live, it is a bitter and painful thing to face. Not every young priest chooses to follow his aged master and live as a recluse in the mountains. The convenience and abundance of urban Taoist temples are undeniably alluring to them. In addition, lack of food, severe cold in winter, lasting loneliness, and very few connections with the outside world, are all challenging tests to many Taoist followers who have chosen a secluded life. In the cities closest to Zhongnan Mountain, “seclusion to escape from society” was once mocked by people as a “Zhongnan Shortcut.” It is undeniable that some indeed hope to win fame through seclusion. However, among such a large group of reclusive Taoist priests, it is hard to tell how many of them are exploring a real way of liberation from life. More and more it becomes a modern way of living for some Taoist priests who are seeking a secluded and self-cultivating life on Zhongnan Mountain while they shuttle between cities and mountain woods, communicate with businessmen and officials to satisfy themselves with fame and physical wealth. Liu Kangle is from the College of Politics at Chang’an University in Shaanxi Province.